The task of keeping your foundation in good condition is vital to the stability and safety of your home or commercial building. Sturdy foundations make for a well supported home; you won’t have to worry about your home becoming unsafe. Plus, a home with a good foundation has significant more value than one with an unstable foundation, as the foundation repair costs can be quite high. Often, the symptoms of a failing foundation (leaning walls, bowing walls, sloped or uneven floors, floor cracks, wall cracks, sticking windows, sticking doors, etc.) lead homeowners to seek out repair methods on their own. While this may sound like a tempting alternative, the only real solution to effectively repair a shifting foundation is underpinning products Atlanta, which should only be used by professionals such as those at Atlas Piers. Underpinning is the method used to lift and stabilize sinking or settling foundations. This process involves extending the foundation into a deeper soil layer. The soil directly beneath a foundation is often susceptible to movement, especially if the water level fluctuates dramatically. The soil a few layers deeper, however is much more stable and less likely to shift. By adding additional supporting piers, piles, or anchors to the footings, we can provide adequate support for the unstable structure and lift the foundation back to it’s original level. The most common underpinning products Atlanta are steel push piers and helical piers. These are the two types of piers used most often to repair a sinking foundation. Steel push piers are long steel rod anchors that work as explained above; they drive deep into a layer of stable soil in the ground and support and lift the foundation. The installation process for push piers is minimally invasive and can be completed without the use of heavy equipment. Because Atlas Piers uses multiple piers in each job and utilizes high pressure hydraulic jacks during the weight transfer, the load on each individual pier is reduced to a manageable amount. Helical piers are very similar to push piers, but there is one important difference between the two. This difference is the threads that are present on helical piers. These threads allow the pier to be screwed into the ground instead of being merely driven into the ground, providing extra stability. 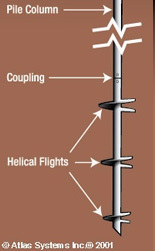 Other types of underpinning products include: micro pull down piles, which are similar to helical and steel push piers and use steel beams and bearing plates to support the structure; and helical slab piers, which are like helical piers, only equipped with a bracket for installation on a slab foundation. Here at Atlas Piers, your satisfaction is our chief priority. That’s why we use the best quality products from reliable foundation repair supplier, ECP (Earth Contact Products). The underpinning products Atlanta from ECP are the best in the business. Make sure your home is properly supported for years to come, with underpinning services from Atlas Piers. Contact us today for more information on how we can save you failing foundation.